Stepper 7 click offers thermal protection, integrated kickback voltage protection, it has a wide range of input voltage, protection against current shoot-through the H-Bridge and reasonably high current capability. 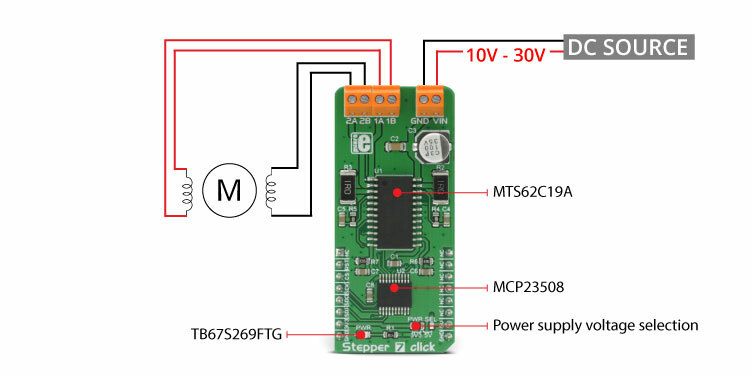 These features make Stepper 7 click an ideal solution for driving motors in any application that demands a precise and safe step motor driver. This click board™ is equipped with two integrated circuits. The step motor driver IC is the MTS62C19A, a dual full-bridge motor driver from Microchip. This IC internal structure is somewhat symmetrical. It features two MOSFET H-bridges used to drive two coils of a bipolar step motor in both directions. The MTS62C19A uses a wide input voltage range - from 10V to 30V. This is the voltage used to energize the motor coils. A separate voltage level is used for the logic sections of this IC and it is obtained from the mikroBUS™ +5V rail. The MTS62C19A has two PHASE inputs which are used to control the direction of current flow through H-bridges and thus, the motor coils. The output current level is controlled by an internal PWM circuit, which is configured using two logic inputs (Ix0 and Ix1), a current sense resistor, and the voltage on the VREFx input - set to +5V on the Stepper 7 click. By setting states on the Ix0 and Ix1 pins, the output current through the motor windings can be limited to 0%, 33%, 67% and 100% of the maximum output current, which is set to about 500mA. This setup allows controlling step motor in both full step and half step modes, by toggling states on the six control pins: PHASE1, PHASE2, I01, I02, I11, and I12. The bipolar step motor coils can be connected to the onboard screw terminals. There are two terminals, used to connect each of the step motor coils. The third connector is used to connect an external voltage, ranging from 10V to 30V, depending on the used motor voltage requirements. It should be noted that without a valid external voltage connected to this terminal, the motor will not work. Also, it should be noted that 40V is an absolute maximum voltage allowed as per datasheet, thus the overtemperature protection might be activated when driving heavier loads. The recommended maximum voltage should not exceed 30V, as stated on the silk layer of the PCB. All of the MTS62C19A control lines are routed to the second IC on Stepper 7 board, which is the MCP23S08, a well-known 8bit I/O expander with a serial interface, used on many of the MikroElektronika’s designs for its simplicity and reliability. It allows the control lines of the MTS62C19A IC to be driven via the SPI and few pins it uses - reducing the required pin count of the Stepper 7 click. This also allows for sending compact SPI messages, instead of toggling several pins at once - which can introduce problems with timing sometimes, especially when those pins belong to different MCU ports. Changing the supply voltage for the port expander allows for different SPI logic levels to be used for the communication - 3.3V or 5V, depending on host MCU. This can be accomplished by switching the position of the onboard SMD jumper, labeled as PWR SEL. 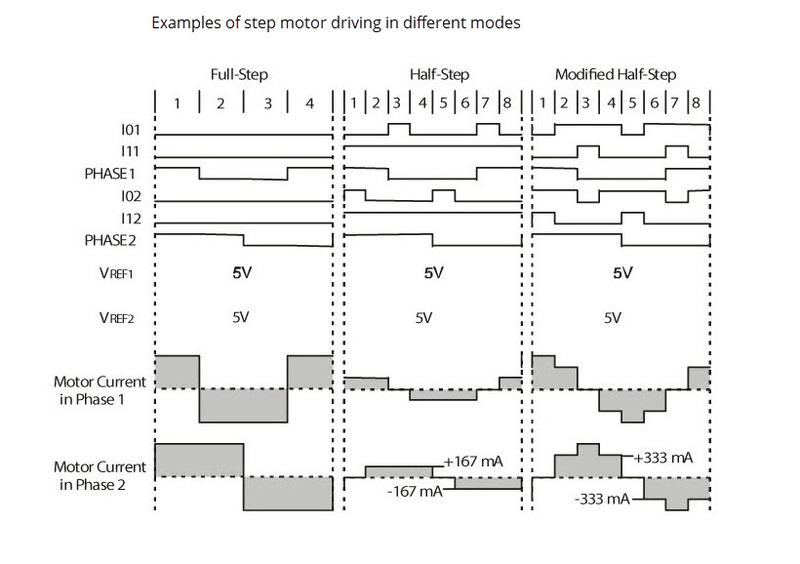 By changing states of the six control pins, it is possible to drive the step motor in full step mode as well as the half step mode. The tables below this text can also be found in the MTS62C19A datasheet, and provide detailed information about how to set the pin states. However, provided MikroElektronika libraries contain simple and intuitive functions to fully control the bipolar step motor, connected to Stepper 7 click. Their usage is demonstrated in the included example application, which can be used as a reference for a custom design. Applications An ideal solution for driving motors in any application that demands a precise and safe step motor driver.